Cut the block of tofu in half, then cut each half into 4 slabs about 1 cm thick. In a flat tupperware container combine the sesame oil, soy sauce, maple syrup, garlic, ginger and green onion. Add the tofu pieces making sure each one is well covered in the marinade. If you have time, refrigerate for half an hour or up to overnight. In a large pan, heat 1 Tbsp oil and swirl to evenly cover. While it heats up, place sesame seeds in a shallow bowl and dredge each marinated tofu piece on both sides. Place one at a time on the hot oiled pan. Fry for 5 to 10 minutes on each side until seeds and tofu are nice and browned. Alternately, you can place the sesame seed encrusted tofu pieces on an oiled cookie sheet and bake for half an hour at 350 until toasty. Baking is preferable for Kaphas. Serve as a side dish with rice, soup, salad, kabobs, whatever you like, and with kimchi and soy sauce or hot sauce or heck even peanut sauce for dipping! Serves 4 as a side dish. That looks delicous! How did it taste? I read on an ayurveda website that individuals with kapha dosha should stay away from tofu, is this true? and what is a good substitute? Yes, soybeans are aggravating for Kaphas, and actually so are sesame seeds, so this recipe isn't idea for people with Kapha dosha. 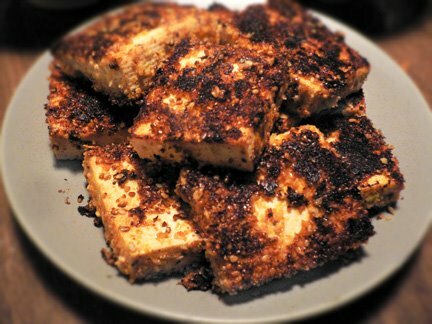 However, if you want to have it anyway, hot (cooked) tofu is better for you than cold tofu, and you can substitute the sesame seeds for crushed sunflower seeds. I have seem to be in the Triple Dosha family, so is Tofu good to eat--I am new to this and not sure. Good question! According to the excellent book "A Live of Balance" by Maya Tiwari, yes, tofu is appropriate for tridoshas. Also, according to the guide on Mapi.com Vatas and Pittas can eat tofu and Kaphas can have it only when hot, so that averages out to a Yes among all three doshas. Wow!! that seems to be a great recipe.I love tofu. I will definitely bake a batch this weekend. I've been looking for new ways to eat tofu. Baking ahead of time so that I can have grab-n-go tofu!